Amid Rajasthan’s shifting sands, intense heat, water shortages, sparse vegetation and cold starry nights, life in this seemingly endless desert is as treacherous as it is mysterious. Nowhere is this clearer than in Pushkar, Rajasthan’s bucket-list number, claimed by some to be the oldest existing city in India. My first trip to Pushkar and I’m hooked, like most travellers here. Nestled between the Aravalli Hills, around 145 kilometres southwest of Jaipur, this mystical little town boasts golden sand dunes, temples, ghats, monuments, hamlets and a holy lake beautifully contrasting the harsh desert surroundings—but it’s best known for its religious significance and the annual frenetic camel fair. A local boy in costume for the fair. The fair is ostensibly for buying and selling livestock, but for every day of the festival there are several cultural programs providing entertainment. Many people race their camels and decorate them to participate in beauty contests. There’s even a competition to see which man has the longest mustache. The festival is exceedingly popular with Indians and foreigner alike, with about 200,000 visitors from all around the globe, and hoards of photographers each year—myself included. 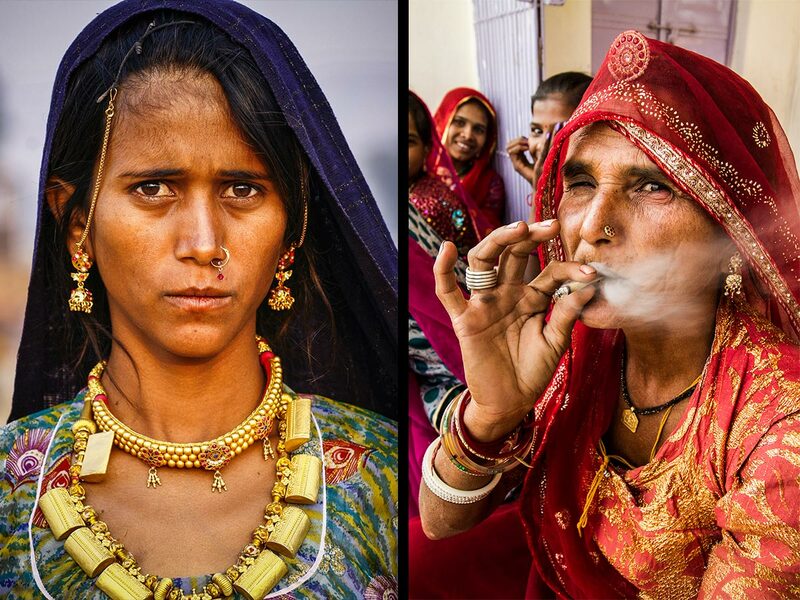 Women from all over India travel to Pushkar for the camel fair. On the busy streets of Pushkar. 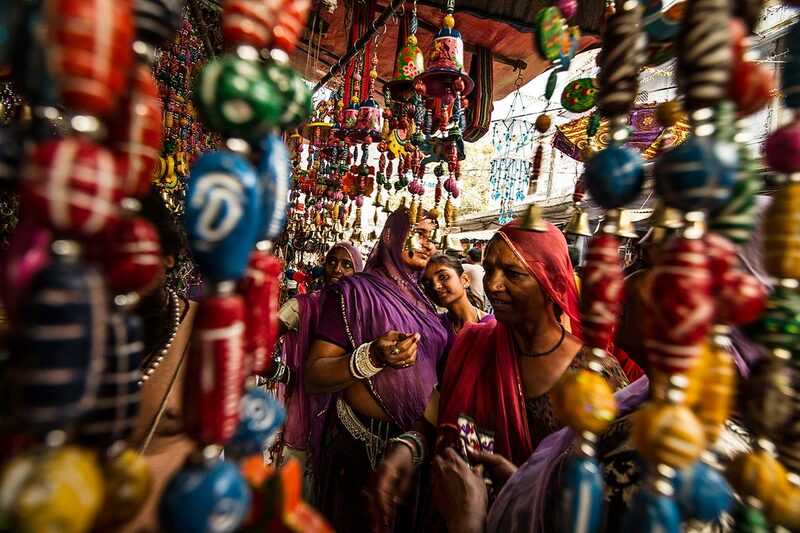 Pushkar is a delight for photographers, as the whole city offers terrific photo opportunities. The landscape’s mesmerizing sun-drenched curves, shimmering sands slithering in the breeze and sinking beneath the feet, provide a dreamlike desert panorama unlike anything I’ve found elsewhere. I stroll past colourfully clad women who pop out everywhere here, from the young to the old, expressing their hometowns, culture and religion. These bold women, adorned with creatively crafted ornaments and accessories, are a delight to look at. Covered with a thin piece of fabric protecting them from prying eyes and symbolizing their dignity, a veil is an important part of their costume. Veils are an important part of women’s outfits, symbolizing their dignity. Looking at the different costumes, one can guess their state and caste; for example, the Rajasthani tribal women wear white shell bangles and a thick necklet made of silver. 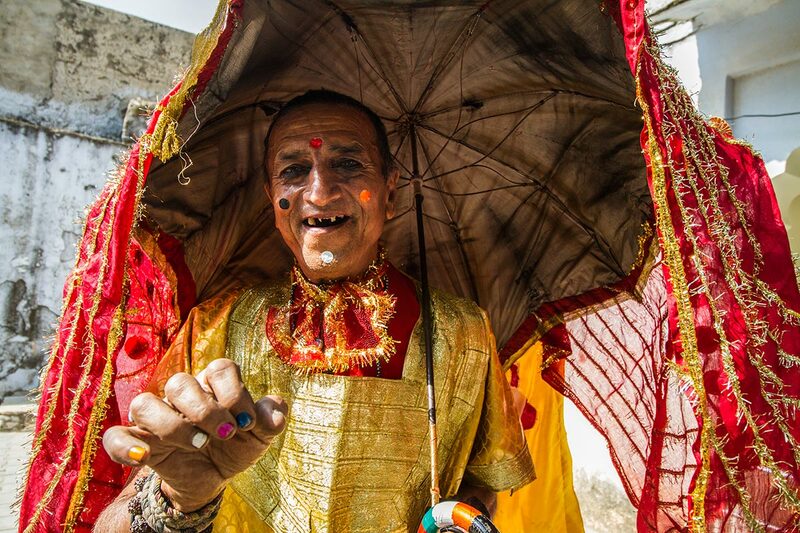 Rajasthani men don’t shy away from colour, either, opting for bright turbans, flashy necklets, bracelets and earrings. 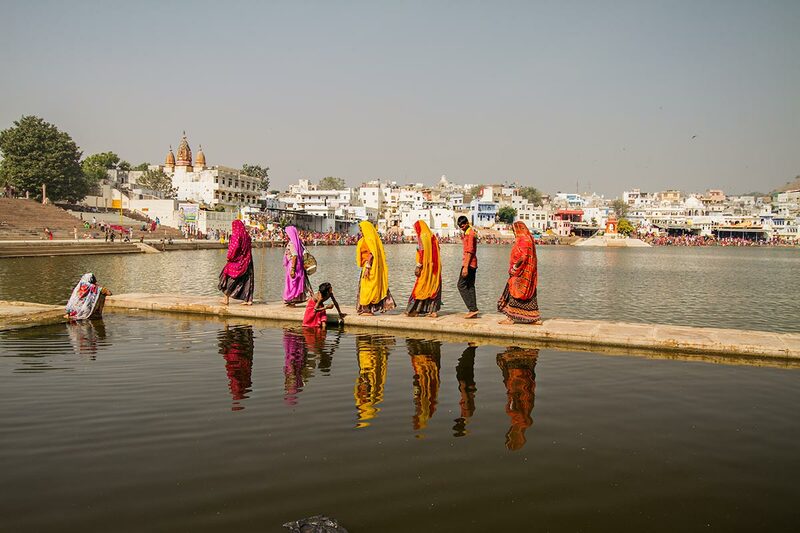 Pushkar, which means “blue lotus flower” in Sanskrit, is one of five sacred pilgrimage sites in India. Visitors often head to the intricate stone Brahma Temple, 2,000 years old and dedicated to Brahma, the creator of the world according to Hindu’s holy trinity. There are few temples dedicated to Brahma anywhere else in the world. The holy lake in the middle of the town has 52 ghats, from which pilgrims descend into the lake to bathe in the sacred waters; unless a Hindu has bathed in these waters, their visits to India’s four other pilgrimage sites would be useless. Pushkar’s holy lake sits in the centre of the town. The ghats come alive every morning, the lake bathed in a gentle hue of the rising sun; women and men submerge themselves to cleanse their sins in its purifying waters offering ceremonial prayers, while temple bells ring in the near distance and birds twitter away. Walking here, I felt happily disconnected from modern life. 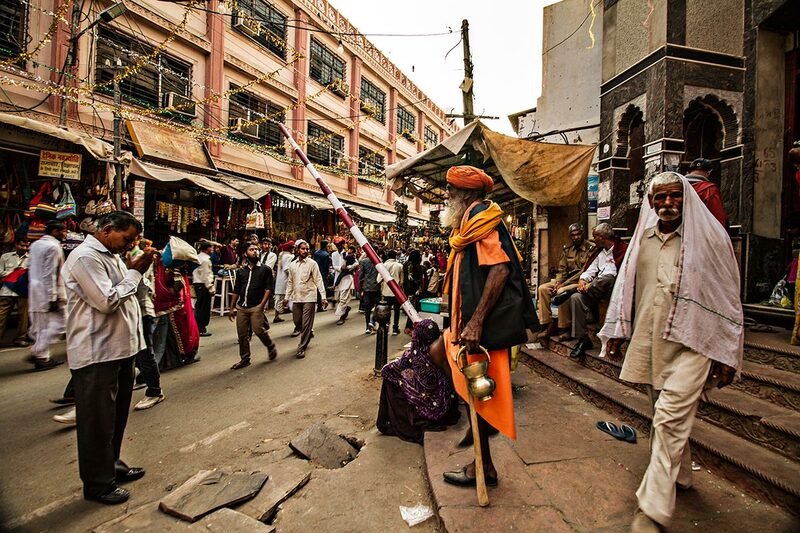 Sadhus, ascetic holy men, congregate in Pushkar during its holy months. They look and act differently from one another, depending on their sect, but they are usually dressed in orange robes. Barring the fake sadhus, these monk-like sages are really quite kind. They often approach tourists, giving them flowers to make an offering to the pious lake and repeat a few mantras to receive blessings for them and their families. This is a swift way to experience a brief Hindu religious ceremony, but before participating, be sure to ask them how much of a donation they expect for performing this ritual. 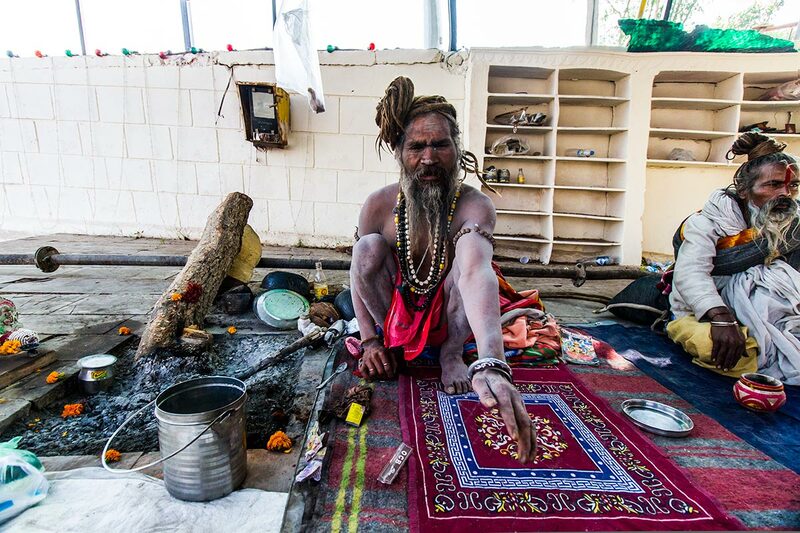 Sadhus are Hindu holy men, ready to offer you flowers and prayers in exchange for a donation. 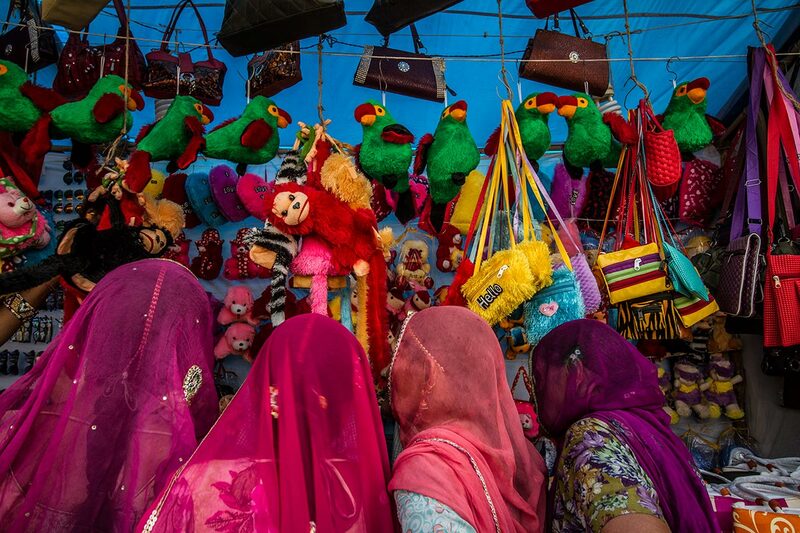 The Pushkar Camel Fair is nothing if not colourful. After a long day of exploring, I settle into a café overlooking the town. Reflecting on my experience of the fair over a cup of tea, I can’t help but be amazed at this little town and its people; it is inspiring to be somewhere so spiritual. 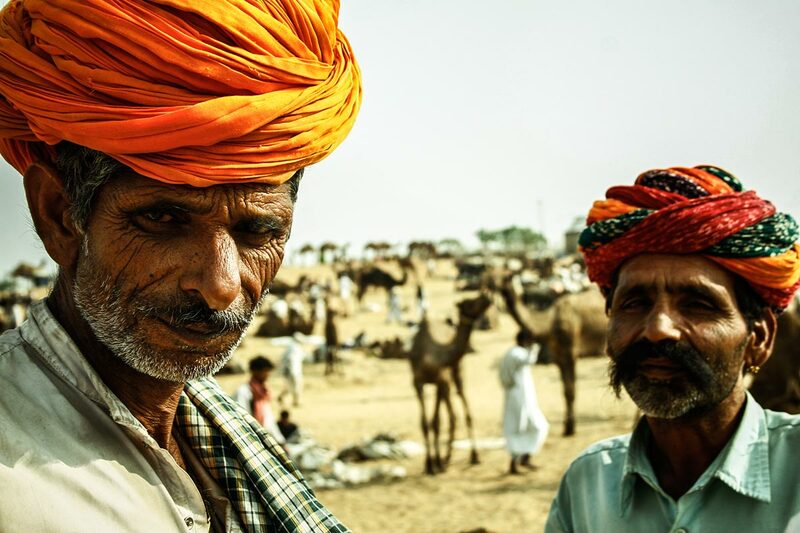 Pushkar allowed me to peer into a very different India, which I had thought was all but lost. Men stand with the festival’s camels in the background. Accommodation: There are plenty of budget hotels, adventure desert camps and luxury resorts available in Pushkar. A highly spiritual town, there are several ashrams where yoga is practiced and taught on a regular basis, many of which offer yoga and meditation retreats. Getting there: Ajmer is the nearest major railway station. From Ajmer, you can ride a 30-minute a bus to Pushkar. Note: Alcohol and meat are prohibited in Pushkar, and photographing the bathers in the holy lake is forbidden. For more stories about India, visit Outpost: India. A travel photographer and writer, Supriya finds inspiration throughout the world. 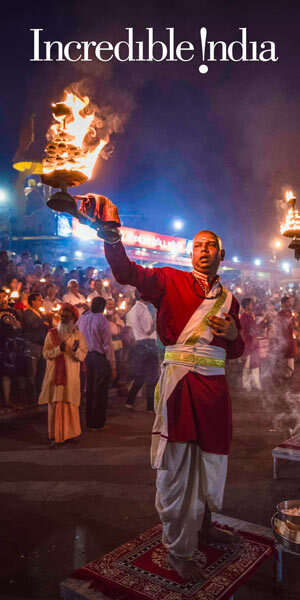 Currently residing in New Delhi, India, she travels globally to photograph people, places, traditions and cultures to experience what makes a place unique. Always looking to embark on a new adventure, Supriya is open to assignments worldwide. INDIAN CUISINE: Curries, Chutneys and Chapatis—Oh My! The Rat Temple of India: Here, that Basic Brown Rodent is King! 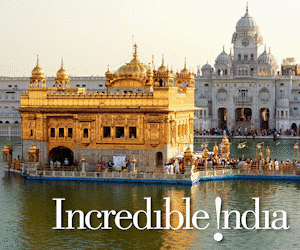 ADVENTURE INDIA: Wildlife, Wilderness, Whitewater!